A distressed Colorado flag print on front. A timeless classic! Blue and Loden (forest green) printed on 100% pre-shrunk cotton. Charcoal printed on 50% cotton and 50% polyester. 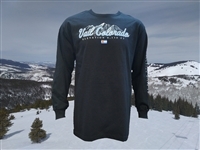 A unique Colorado "C" with mountains logo across the chest and printed design along left sleeve. Comes in royal blue or kelly green. 50% cotton, 50% polyster. This new arrival for the 2016/2017 ski season is a great shirt, especially for the price. This mountain print is a sharp, eye catching design printed on a selection of fabrics. The charcoal and red are a 50/50 cotton poly blend, and the mint color is a 100% cotton shirt. This colorful design has been a big hit! 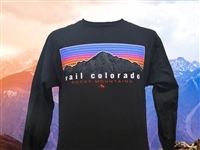 It has a large print on the front of the shirt with horizontal stripes over the mountains in the color scheme of a beautiful Rocky Mountain sunset. The black colored shirt is 100% cotton and the other two colors are a 50/50 cotton poly blend. New for the 2016-2017 ski season! This great design is priced to sell. This large mountain print has rays of sunshine coming off of it in a circular pattern. The mint colored shirt is 100% cotton and the red is a soft 50/50 cotton poly blend. Also available in short sleeve here. This fun "trippy" design is printed on your choice of 2 different materials. Mint color is 100% cotton, purple and charcoal are printed on a 50/50 cotton/poly blend. Large front print with nothing on the back of the shirt. Another great value long sleeve shirt. Our black shirt is printed on 100% cotton. Our charcoal shirt printed on 50% cotton 50% polyester. This popular long sleeve shirt has a full back print with a small left chest logo. It's printed on a 100% overdyed, preshrunk cotton for a unique color look. Also available in short sleeve here. A great mountain paradise graphic showcasing the mountains and the feel good vibe of Vail, CO. Printed on over dyed, preshrunk 100% cotton. One of our all time best sellers! Left chest/full back print. 100% overdyed cotton. A great way to remember your Back Bowl experience. Front/back/sleeve print 100% garment dyed cotton. This is garment has a soft hand made up of 50% Poly, 38% cotton and 12% Rayon. This is a very comfortable shirt decorated with a full front distressed silk screen design. This beautiful design has a nice floral pattern that incorporates a mountain design at the top with the words "Rocky Mountains Colorado" around the outside. 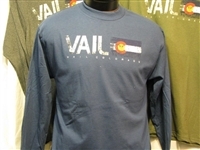 It has a large two color sleeve print that reads Vail Colorado. Both color shirts are printed on a 100% cotton overdyed material. This vibrant design shows the snowy Rocky Mountains with a skier at the bottom and the date that the town of Vail was established. This great logo is printed with a small left chest print matching the large back print on overdyed 100% cotton material. One of our best selling shirts. also available in short sleeve here. This beautiful pastel colored design is printed on a 100% cotton over-dyed t-shirt. It's a large back print with a matching smaller front left chest print. This design is derived from a Colorado flag C with the yellow center that represents the large amount of sun that our great state gets. This vibrant shirt has a burnout style material except for the sleeves which are solid. It's a tri-blend material consisting of 50% polyester, 25% cotton, and 25% rayon for an extremely soft feel and comfortable wear. So comfortable, you may just fall asleep in it! An excellent choice between a heavy hoody and a long sleeve shirt. Printed on a light weight tri-blend (50% Polyester, 37% Cotton, and 13% Rayon) long sleeve, hooded hybrid. 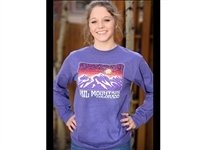 Get excited and get your Vail spirit on with this heavy cotton screen printed spirit jersey!! It has a graphic on the left chest as well as a large graphic on the back shoulders. It has a distinctive look with classic features in this very well made long sleeve spirit jersey. Represent Vail, Colorado to the fullest!! !